The start of April marks the time when the western snowpack approaches its usual annual maximum. This winter brought record precipitation, including snowfall extremes from Seattle to Flagstaff, boosting this year’s snowpack totals. According to the USDA’s western SNOTEL network, this year’s end-of-season snowpack was above average for just the third time in ten years and the seventh time in twenty years. 2019’s overall western snowpack is 25 percent above the median normals, with especially high values in California, Arizona, and Nevada. Since snowmelt makes up around 75 percent of the West’s water supply, this above-average year will help farmers and city water users alike. 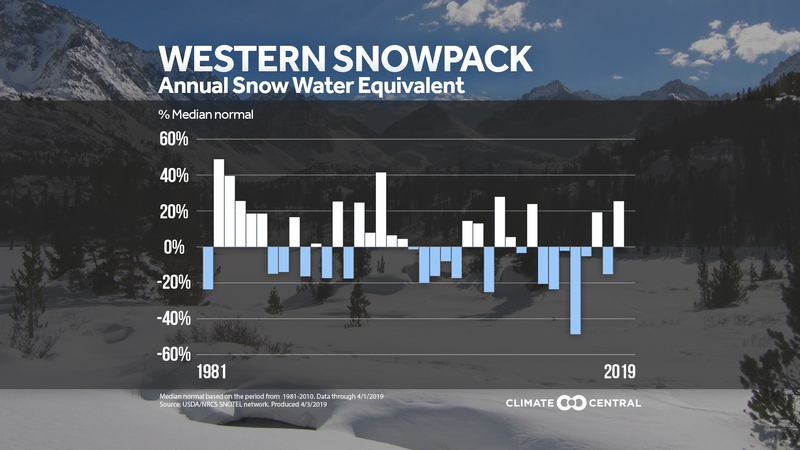 However, western snowpack is decreasing in the long term with human-caused climate change. Warmer air is turning potential snow into rain for some lower-elevation areas. Meanwhile, other areas are experiencing less precipitation overall, with that trend expected to continue. According to a December report from the University of Arizona, some western areas have recorded snowpack reductions of 41 percent in 35 years. Western drought shows similar trends. This winter’s rain has helped ameliorate severe droughts in the current U.S. Drought Monitor. (Although the rain has led to extreme flooding, of course — see our heavy rain toolkit for relevant graphics). Still, it takes more than one rainy season to restore the groundwater that the West relies on. 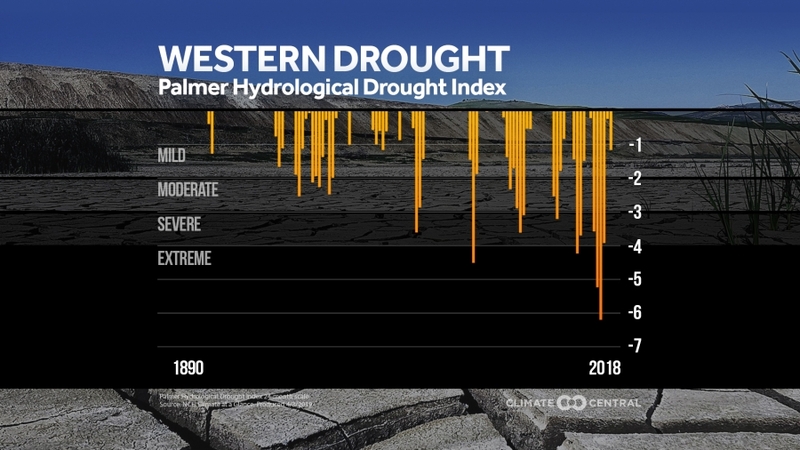 As we reported last month, drought and water deficits are projected to be the highest-risk climate impact for 40 percent of U.S. cities — including much of the West. These droughts carry major costs, from intensifying wildfires to damaging crops that the nation depends on. Droughts have cost the U.S. billions of dollars every year since 2011, particularly in California which produces two-thirds of the nation’s fruits and nuts. Thank goodness the Golden State is nearly drought free — for now. Methodology: Western snowpack data (as of April 1) are from the U.S. Department of Agriculture western U.S. SNOTEL network. Values are expressed as a percentage above or below the median normal (1981-2010) snow water equivalent for the major western river basins in the SNOTEL network. Drought graphic illustrates the average of the previous 24 monthly values of the Palmer Hydrological Drought Index for the Western U.S. climate region (California and Nevada) at the end of each calendar year. For example, 2018 data comprises the 24 months from January 2017 through December 2018. Methodology developed by Deke Arndt at NOAA NCEI. Climate change science has already shifted towards regional modeling, which can refine long term forecasts for regions such as the western U.S. I’ll be reporting this new science on subsequent posts for my readers to watch for. GOP is shifting tactics, moving to the next stage of #ClimateChange denial with Rep. Matt Gaetz (R-FL) announcing his "Green Real Deal" to not tackle climate change, pretending to focus on "innovation." Extreme Temperature Diary 2019. permalink.